Candy Experiments: Safety masks for candy experiments? Recently we heard from the organizers of the USA Science and Engineering Fair, at which we will be presenting in October, that the NPS would require us to use goggles, safety masks, and gloves for all our experiments. 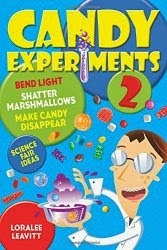 Like testing sour candy for acid with baking soda, squashing marshmallows, separating dyes, and finding hidden candy. "It's just candy," I tried to explain. "It's not explosive. It's not even toxic. You eat it." But the department strictures couldn't be waived. Buereaucrats. Thankfully, the sympathetic USASEF organizers are working solve the problem. We'll wait to hear back from them. In the meantime, I encourage everybody to keep doing candy experiments at home. Even without safety masks.